I think Lili’s thoughts, I dream her dreams. 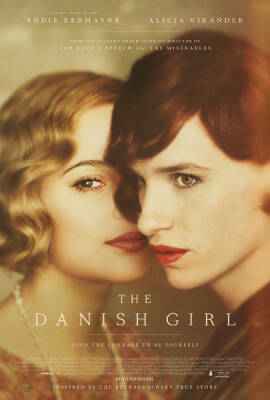 The Danish Girl is emotionally affecting, but avoids deeper exploration of the transgender experience. Based on David Ebershoff’s novel, this is a heavily fictionalised account of the life of Lili Elbe. Einar Wegener [Eddie Redmayne] and Gerda Wegener [Alicia Vikander] are happily married artists in Denmark. When a model fails to show, Gerda has Einar don a pair of stockings to assist her, leading Einar to discover that he likes it. Adopting the character “Lili”, the couple enjoy Einar’s cross-dressing until he becomes unable to set aside his female persona at will. Life in Denmark becomes difficult just as Gerda’s portraits of Lily are gaining her recognition, leading the couple to move to Paris. A succession of doctors are unable to provide help until one believes that Lili is a woman trapped inside a man’s body, offering to perform pioneering experimental surgery to correct the problem. The central performances are superb. Redmayne makes Lili’s emergence seem natural, nervous and fumbling at first, but increasingly confident over time. Vikander portrays Gerda sympathetically as a supportive but conflicted wife struggling to come to terms with the fact that, in order to help him, she must let her husband go. Gerda’s varying reactions over time are playful, irritated, concerned and angry before finally reaching a reluctant sad acceptance. The tragedy of her position is arguably felt more keenly than Lili’s, perhaps because her character is more rounded, or perhaps simply because much of the audience will find Gerda a more relatable figure. Einar’s conflict is presented from the outside in a rather sanitised way. Although the film features some sexual content, the scenes chosen are those least shocking to the audience. Although we feel for Einhar when a series of doctors brand him either a deviant or insane, we are never really presented with a better understanding beyond poetic lines of dialogue about Lili having always been a part of him, nor is there a strong sense of Lili’s rejection of her body. Whilst it does not claim to be a historic account, the film’s efficacy depends on what one considers to be the chief intention. As a dramatic and emotionally powerful portrayal of Gerda and Einar’s struggle, it resonates well. However, as an exploration of the feelings that lead Einar to transition into Lili, and Lili’s desire for physical alterations to reflect her identity, the film falls short. Nevertheless, it does raise fascinating questions of identity that linger beyond the closing credits.